I just realized, I never wrote a post about my one year birthday (April 24). Well, it came and went. I now have an additional tattoo that represents one year of freedom from drugs and alcohol. 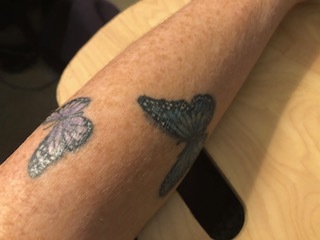 I plan on getting a new butterfly tattooed up my arm and all over my back, so that when I'm 85 years old I will have a flock of freedom. In AA, to be sober, they tell you that you must choose to go to ANY LENGTHS to stay sober. For me, ANY LENGTHS meant going public with my disease and tattooing myself for all eternity (at least until I die). Those lengths have made the choice to pick up a drink or not pick up a drink fairly easy most of the time. I've said before, but I don't mind repeating myself, my AA meetings are Church for me. I continue to be inspired by the spiritual practices and journeys of my fellow recovering peers. Their testimonies of having a life with serenity and connection to their Higher Power challenge me to work more diligently on my own connection. The rawness of someone's share where they vulnerably cry out in anger and despair continually reminds me that the same despair is waiting for me after that first drink. It's this inspiration that I want to bring back to my congregation. I'm using Emmet Fox's book "Sermon on the Mount," which influenced the founders of AA and much of the creation of the 12 steps. I'll be preaching a summer sermon series where we are diving head into the sermon of one of the most famous spiritual guru's that ever existed - Jesus of Nazereth. My sense is that if I can move my congregation away from religious doctrine (what to believe about God) and toward spiritual practices that nourishes the soul, we will become a vibrant community of people who take their journey with God seriously. As Emmet Fox writes, the whole point of Jesus' teachings was to "wean our hearts away from relying upon outer things, whether they be for pleasurable gratification or even for spiritual salvation," he wanted us to separate ourselves from these external ways and drum into us a whole new attitude of mind all together. My prayer is that I will continue to develop this whole new attitude of mind and find the kind of Joy, Love, Peace and Hope that only God offers. And then... pass it on. You are simply amazing and so is God. You two make a great team.